How Much Can You Make in a Graphic Design Career? What Courses Can be Taken for an Online Graphic Design Degree? Graphic designers apply artistic theories and communication skills to create engaging messages through print and multimedia platforms. With an undergraduate education in graphic design, you can work in business, information technology (IT), or art and design. Companies and organizations increasingly require dedicated graphic designers to help them reach global audiences. The Bureau of Labor Statistics (BLS) projects multimedia artist positions to grow 8% through 2026; web development jobs stand to increase by 15%. 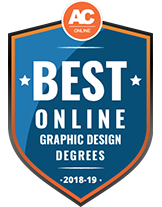 By earning a graphic design bachelor’s degree online, you gain the necessary training to pursue entry-level jobs and graduate academics through coursework with a flexible schedule. An online education also strengthens the technological training graphic design students get as part of their core degree work. Distance learners benefit from affordable tuition and the same university resources as their campus counterparts, such as research guidance and internship placement. This guide provides in-depth academic information, including degree structure and course options. It also provides insight into financial aid and career opportunities. This ranked list provides students with information to find the online bachelor’s degree in graphic design that suits their professional interests and goals. Criteria include tuition prices, financial support, student services, and graduation rates. The list also considers online course availability and opportunities for curricular personalization through electives and concentration areas. Supporting data comes from the Integrated Postsecondary Education Data System, a series of government-mandated higher education surveys facilitated by the National Center for Education Statistics. Established in 1911, Gateway Technical College is one of the largest members of the Wisconsin Technical College System with approximately 25,000 students. It offers a 2-year online or hybrid Associate of Applied Science in Graphic Communications. The program is designed for creative people who wish to work extensively with computers, advanced technology and designing tools. Students at GTC work with cutting-edge tools that prepare them for a variety of careers in fields like printing, advertising, branding, web design, multimedia and photography. Required courses include Introduction to Digital Photography, Illustration Media Concepts, Multimedia Survey, Technical Reporting, Advanced Illustration and Design Concepts. Upon completion of the program, graduates can apply design principles to develop products and services in communications and marketing. GTC graduates also can implement ethical business practices and articulate artwork rationale. To graduate, students must complete a minimum of 60 credits with an average of 2.0 GPA or higher. Additionally, some GTC graduates go on to pursue additional certificates that focus on modern skill sets. GTC offers 2 certificate programs for those who wish to add a specialized area to their associate degree. Consisting of 13 credits each, distance learners can acquire a certificate in digital photography or desktop publishing. Adding a certificate on to your program requires a little more than 1 extra semester. Incoming students can receive credit for prior learning including military evaluations and the Prior Learning Assessment. Prospective students can submit either their ACT or SAT scores taken within the previous 3 years or take the Accuplacer placement test. The training and hands-on experience students gain from bachelor’s degree in graphic design programs enable them to occupy such positions as photo editor, commercial designer, and multimedia animator. They can also pursue business careers like social media coordinator and marketing specialist. Additionally, graphic design students can apply their skills in IT roles, including web development, video game design, user interface, and mobile applications. The five careers detailed below suit graphic design bachelor’s degree holders. Professionals can advance into higher-paying leadership positions by accruing work experience, professional certification, and post-baccalaureate education. As students research career options, they should pay attention to positional growth and salary potential. These characteristics not only help professionals discern immediate employment opportunities, but also allow them to predict future prospects. Using hand-drawn images or computer-generated graphics, these professional artists create visual concepts that inform and persuade audiences. Graphic designers oversee the layout and overall design of magazines, brochures, and corporate documents. They also work with digital media, including computer software, mobile applications, and websites. While graphic designers can work for studios and design firms, BLS data shows that nearly 20% of these professionals work as freelancers. These design leaders manage their company or organization’s visual aesthetic. Working with teams of marketing specialists and graphic designers, art directors develop advertising campaigns, product packaging, and television and movie productions. They also oversee daily administrative tasks, such as employee coordination, scheduling, and budgeting. Most art directors pursue self-employment, while the remainder work for advertising firms, publishers, and studios. Multimedia artists and animators create visual effects and dimensional models using computer programs and illustrators. These professionals typically specialize in a particular medium, such as film, television, or video games. Multimedia designers meet with clients to conceive guidelines through planning and storyboarding. While they may individually work on portions of a project, these artists eventually collaborate to ensure a cohesive and finished product. These business leaders create campaigns and programs to generate consumer interest in a product or service. Marketing managers lead teams through the development cycle, from conception and planning to creation and disbursement. They also communicate with clients and directors on marketing and budgeting plans. Marketing managers can specialize in promotions, connecting advertisements with purchase incentives. In addition to a bachelor’s degree, professionals need extensive work experience to access this career. These professionals oversee website design, from look and layout to technical aspects, like speed and user capacity. Working with artists and IT specialists, web developers also create website content. Some developers focus on backend mechanics, such as coding and testing applications. Others work as webmasters, maintaining website performance through troubleshooting and software updates. To pursue this career, students need at least a bachelor’s degree. Most web developers also pursue certification through organizations like Google. When researching graphic design career opportunities, students should examine job growth and wage potential by geographical location. Salary varies by city and state, which can indicate industry strength in that area. Wages also differ between professionals within the same field, reflecting individual credentials, experience, skill, and achievement. According to BLS information, the 10% lowest paid graphic designers earn less than $28,560 annually, while the 10% highest earn over $83,410. Professionals in advertising, public relations, and specialized services stand to earn the most. California, New York, and Florida boast the highest employment rates for graphic designers. New York, Utah, and the District of Columbia represent areas with the highest concentration of employed graphic designers. Online bachelor’s in graphic design programs frame degree plans around three key outcomes. Firstly, students cultivate knowledge in design principles, including color theory, layout, and typography. Secondly, they apply core concepts to create messages and design solutions for diverse audiences. Thirdly, students develop technical skills for print, multimedia, and web design. Core classes include digital imaging and graphic design history. Beyond these fundamentals, course offerings vary based on departmental focus and faculty expertise. Below are five possible classes for online graphic design degree plans. This course covers fundamental elements and principles of print-based and web-based design. These principles include balance, hierarchy, contrast, visual communication, and color theory. Students apply knowledge by creating logos and pictograms. In addition to learning about typography history, students work with type as a standalone design element. Topics include typeface, character recognition, measures, legibility, and manuscript specifications. Students integrate type with imagery to create and evaluate hierarchical meaning. Using Adobe Illustrator, students develop core skills in visual graphic communication. They work on creative exercises, mastering principles like shape grouping, figure/ground manipulation, and letterform creation. Through these exercises, students also familiarize themselves with formal art elements, including line, color, shape, pattern, rhythm, and space. This advanced course trains students to design and develop interactive interfaces with respect to user experience fundamentals. Students explore the creative possibilities of the internet medium. They also study technical aspects like programming and software integration. Students apply graphic design theories to create digital web documents for communication and marketing purposes. They learn about the technical elements of web design, including navigation and functionality. Students also study the creative and technological differences between desktop computer and mobile internet applications. When choosing a graphic design bachelor’s degree online, students should consider cost, factoring institutional support and external financial aid. They should also think about course delivery systems. Some schools operate asynchronous classes that allow students to access materials and connect with peers and professors at any time. Other schools facilitate live classes to bolster interactivity and student collaboration. Online students should ensure chosen schools maintain national, regional, and/or specialized accreditation, or the degrees they earn may not be valid to employers and other learning institutions. This section answers five popular questions from prospective graphic design students. What are the differences between a bachelor of arts (BA) and a bachelor of fine arts (BFA) in graphic design? BA programs offer students a broad graphic design education within a liberal arts framework, emphasizing theory and history. Students benefit from ample electives, allowing them to pursue a minor and second major. BFA in graphic design degree plans offer extensive technical training for students who know they want to pursue a career in this field. Internships and studio presentations are common requirements. To enroll in a BFA program, students usually undergo a portfolio review. How will an online graphic design degree help me reach my goals? Accredited graphic design programs empower students through industry-relevant training. By earning a bachelor’s degree, students show employers that they understand core artistic principles and possess skills in popular software like Adobe, Inkscape, and GIMP. Graduates can further aid job prospects by earning optional certification/licensure, such as the Adobe Certified Associate credential. Certification exams often require candidates to hold a bachelor’s degree. Undergraduate academics also train students in critical-thinking and research skills, paving the way to graduate academics. What strategies should I use when picking my graphic design classes? Students should examine a school’s degree structure carefully. Some programs allow personalization through open electives and concentration options. Other schools, particularly BFA programs, operate a fixed degree path with clear internship and capstone requirements. Most colleges and universities post course offerings online. Students should consult these schedules regularly since required or interesting classes may only be available once per year. When picking advanced coursework, students should consider if the skills they develop in these classes help them achieve post-graduation goals. When in doubt, students can seek guidance from academic advisers and faculty. What concentrations are available for the online bachelor’s degree in graphic design? Graphic design concentrations generally fall into business, fine arts, or IT fields. Students can apply creative skills in marketing or public relations, taking classes like consumer behavior and media writing. They can also pursue a studio art concentration, allowing them to occupy positions as a photographer, museum curator, teacher, or exhibition painter. Finally, graphic design majors can specialize in web design, 3D animation, and interactive media. Some schools even provide a dedicated gaming concentration, with such courses as programming logic, digital storytelling, and game production. What assignments and projects can I expect from a bachelor’s in graphic design program? In addition to lecture-based and discussion-based classes, graphic design students spend much of their school day in studios and technology labs. Here, they hone conventional art and computer skills through project-based assignments. To mimic the critiques creative professionals get from clients and consumers, students regularly receive feedback from instructors and peers. Degree candidates round out academic training with a capstone experience that usually entails a portfolio presentation and review. By curating portfolio content, students stand ready to explain their brand identity and defend their work during job applications. 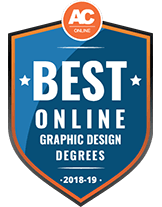 To help pay for their online graphic design degree, students can take advantage of institutional awards based on need and academic achievement. They can also seek government funding by submitting the Free Application for Federal Student Aid. Loans represent another type of financial aid. Students should only use loans after exhausting all other funding opportunities. Grants and scholarships are preferred over loans since students do not need to pay these funds back. The table below details five scholarship opportunities for online graphic design degree candidates. The American Institute of Graphic Arts provides a scholarship to promote diversity within the field and foster environmental activism in young artists. Awards range from $500-$5,000 and go toward tuition payments. To apply, candidates must hold a minimum 2.0 GPA and demonstrate financial need. Although it is not a requirement, minority status significantly bolsters a candidate’s chances of obtaining the scholarship. Students must also submit a written statement demonstrating their dedication to social justice. The Digital Signage Federation operates a $2,000 scholarship for female students pursuing a bachelor’s in computer science and/or digital design. To apply, candidates need a minimum 3.0 GPA. They must submit two recommendation letters and a 500-word personal statement. This essay should detail how the applicant can use their creativity for the benefit of the digital signage field. Candidates must cite a personal digital design achievement in the statement. DSF strongly suggests that applicants also send in a video message addressing the judging committee. Founded in 1998, TLF advocates for diversity in the marketing, advertising, and public relations fields. The foundation offers a $2,500 scholarship to bachelor’s degree candidates with a minimum 3.0 GPA. Candidates must be African-American, Asian American, Native American, or Hispanic/Latino. To apply, students must submit a current resume, one recommendation letter, unofficial transcripts, and an up-to-date headshot. They must also write a 1-2-page essay that outlines their career trajectory and explains how ethnic diversity strengthens businesses and organizations. Dedicated to the advancement of television and electronic media, the Academy facilitates five $10,000 scholarships, including the Randy Falco Scholarship for Hispanic or Latino students pursuing careers in the television industry. The Academy also offers the Douglas W. Mummert Scholarship for graphic design and multimedia students with a history of community service. There are also awards for students with career goals in television journalism and sports television. Candidates apply through a comprehensive online application system. The Outdoor Advertising Association of America provides a $3,000 scholarship for students enrolled in an accredited design program at the associate, bachelor’s, and master’s level. To apply, candidates must submit three digital copies of their portfolio, which they cannot get back. The portfolio cannot exceed two pieces. Applicants must also submit an essay outlining career goals and explaining why they deserve the scholarship. Additional requirements include recommendation letters, academic transcripts, and community service details.